Solar PV or photovoltaic panels and solar panels for heating water are a viable and attractive option for Irish people to use to help power your home. For years Solar panels have been a minority technology in Ireland mostly due to the costs but this has changed substantially recently. Solar Panels are now a financially viable alternative to offset our use of damaging fossil fuels. See below for the our range of solar PV products which can produce free electricity for your home or commercial development. All PV panels supplied are TUV certified and come with a guarantee to supply 90% of full power for 10 years, 80% of full power for 25 years. This warranty is backed up by insurance from Chubb. There is also a 10 year manufacturers warranty. Perfect for both Grid tie and off grid applications, We have drawn up a quick cost-benefit analysis of a 2kWp system to demonstrate how these systems will save you money. 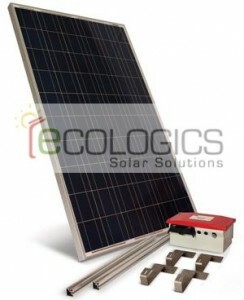 1.25 kWp Solar PV Panel Kit. 5 x 250 Watt solar PV panels. Roof mounting kit for 4 solar panels.1 x SMA Sunnyboy 1200 Inverter. suitable for Grid connection in Ireland and the UK.